The numbers are in and FOX Sports is reporting that they blew away CBS, ABC and ESPN to win the 2009 sports ratings "crown". It may not be fair to include ESPN in the comparison because unlike FOX, it is 24/7 with multiple networks which factor into the numbers. But include them they did. It is unclear why numbers for NBC Sports were not included. Here is a graphic showing the 2009 comparison. and here is the release issued by FOX Sports. 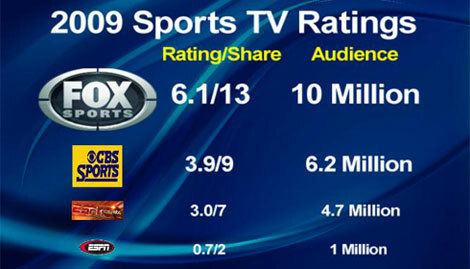 FOX Sports continued its position as the nation’s leading producer of big event sports finishing 2009 as America’s No. 1 sports network for the 13th straight year, according to Nielsen Media Research. All sports-related programs on FOX averaged a 6.1/13 household rating/share, with an average audience of 10 million viewers. FOX Sports out-distanced second place CBS (3.9/9, 6.2 million) by +56% in rating and 61% in audience; ABC (3.0/7, 4.7 mill.) by 103% and 113%, respectively, and ESPN (0.7/2, 1 mill) by 771% and 1000%, respectively.